Ready to build your final rows? I forgot to post this earlier because I’ve been so busy, I have no idea what day it is most of the time! This row is easy, but takes a bit of time. From bright prints, you’ll need 60 pairs of strips 2 1/2″ x 8 1/2″. In other words, you’ll need 120 of these strips, matched up in pairs. From the white background, you’ll need 60 strips 2 1/2″ x 8 1/2″. For each “unit”, you’ll need one pair of the print strips, and a white background strip. Match the print pair up, right sides together, and stitch them together down the long side. Press the seam toward the darker fabric. 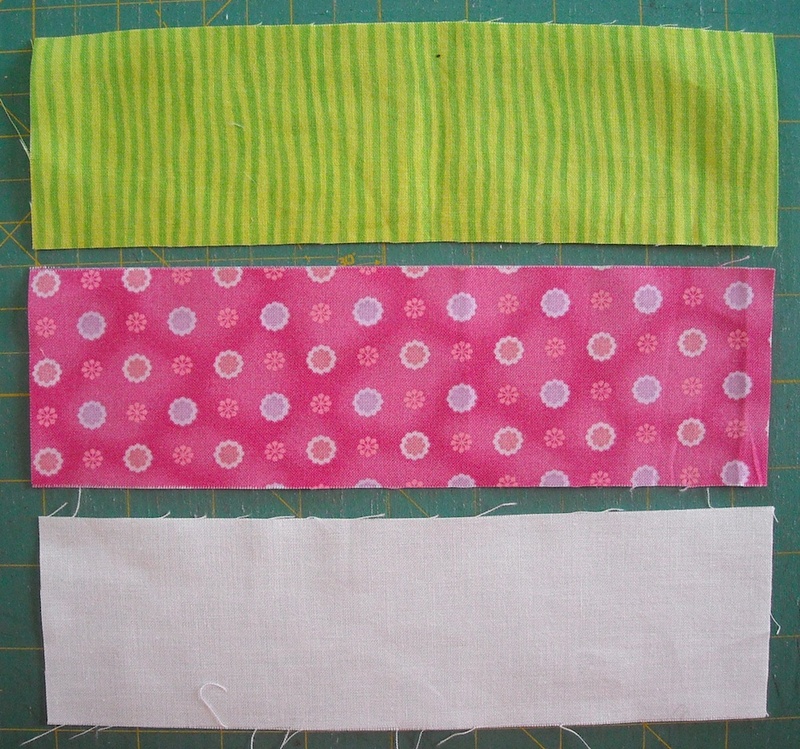 Now subcut this piece into 3 segments 2 1/2″ wide, as shown. Just discard the little leftover portion off the end. 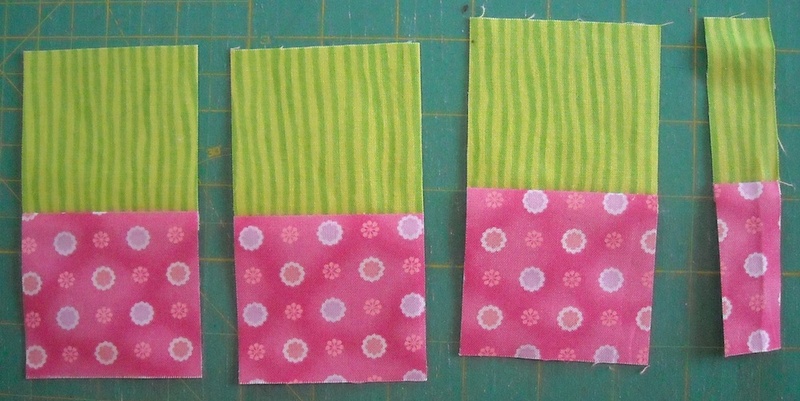 Next, sew these 3 segments end to end to look like this, pressing seams toward the darker fabric. 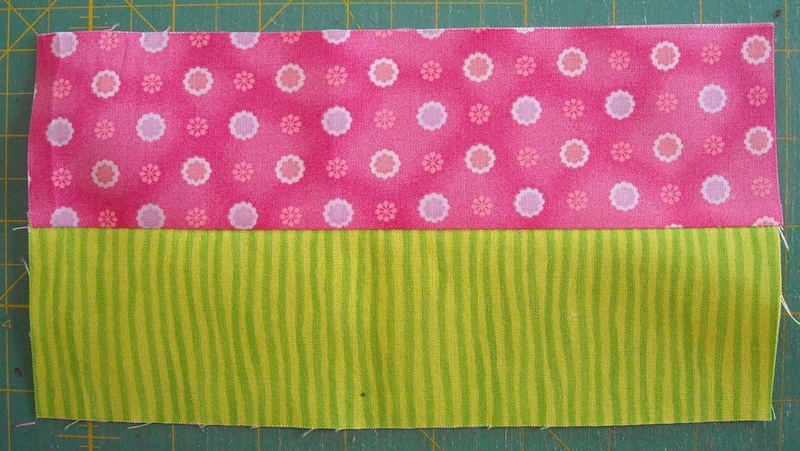 Now sew the white background strip to this strip at both short ends. It’ll be a large loop. That’s the way it’s supposed to be. Now, you’re going to randomly pick a spot along the white strip, and cut across it to “undo the loop”. Press the seams toward the print fabrics. Now, you just need to repeat this 59 more times! Every time you cut the white background strip, just randomly pick a different spot along the strip, so that they are all different lengths on both ends of the print part. This is what makes them go up and down along the row. Now separate the units into two piles of 30 each. Arrange them in a row in an order that suits you, and sew them together. Make 2 rows of 30 units each. Each finished row will measure 20 1/2″ x 60 1/2″. That should keep you busy for a while. Next week, I’m going to post on Wednesday instead of Monday, because I’ll be out of town at the trade show in Houston — Quilt Market. But that day will be the final instructions for setting the quilt together, so be sure and check back! I was wondering how you got them so random. Looks like a fun process. Glad I have till Wednesday to get them done!